One of the reasons I went to culinary school, after working in professional kitchens for a few years, was to have an understanding of why my recipes didn’t always work. Things would succeed if I followed the recipe to the letter, but if I played or strayed at all they would have as much chance of being a disaster as they did a winner. In culinary school I learned enough about food science to be able to play with recipes or create my own from scratch. I learned why eggs should be warm when you whip them and why you should use low protein flours for cakes and higher ones for breads. They taught me about Brix, Baume and other technical ways to measure sugar in sorbet solutions so they will freeze, but not become a solid brick of ice. After school, once I could afford it, I bought a Refractometer , which shows you the sugar content in a solution. This way I can mix up a batch of any kind of fruit sorbet, add some simple syrup and the sorbet will be a success. But, what if you are just making sorbet a couple times a year, do you really need such a geeky, expensive gadget? Not unless you are a kitchen equipment hoarder, like me. So, then what? There is another way to have a greater chance at success than just praying for the best. You can use a method that involves floating an egg in your sorbet. Yep, I said FLOATING AN EGG, the whole thing, in the shell. It is also a very cool experiment to do with your kids. As the solution gets more saturated with sugar, the egg is buoyed to the surface. 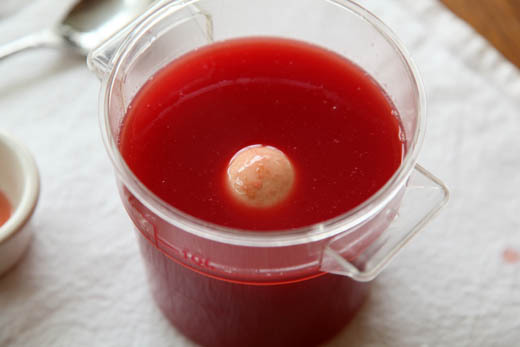 Once the egg is actually floating partially above the surface, the solution has enough sugar to prevent the sorbet from being too icy. Perhaps not as impressive as whipping out your refractometer, but pretty amazing in a Beakman’s World kind of way and it allows you to make sorbet from just about any juice. Obviously, this will not work with all fruits, banana puree tends to be too thick and the egg, no matter how sweet the solution, will float on the surface. But, for citrus and other thin juices, it is wonderful. 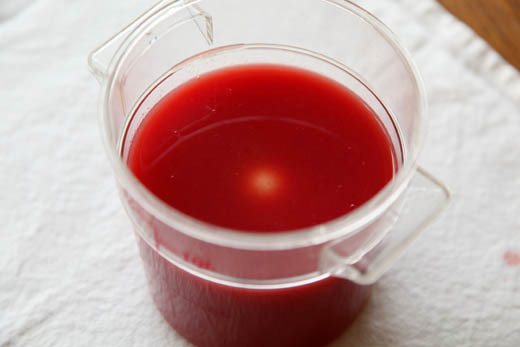 3 cups juice (your choice, just make it a thin one), chilled (if you are using lemon or lime juice, it is too intense all on its own and you should start by diluting it with some water. I usually go with 2 parts juice, 1 part water). 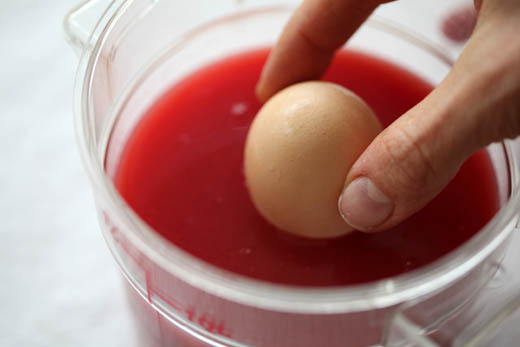 Put your juice in a container that has room to add more liquid and is deep enough that you can submerge an egg. Gently place the egg in the container. At this point it will probably sink straight to the bottom, so don’t just drop it in. If it heads to the bottom, remove it and add about 1/2 cup of the simple syrup. Stir and try the egg again. This time when you put the egg in it should be suspended in the liquid, maybe not to the surface yet, but hovering just below. Can you see the egg in mine, I am pointing at the faint white spot under the surface. Remove the egg. Add another 1/2 cup of the simple syrup and stir. Place the egg in the sorbet, now you can see it starting to emerge. It needs to be about the size of a quarter above the surface to indicate that there is enough sugar in your solution. Add it a couple of tablespoons at a time until you have the right level. Once it is floating high enough, add the liquor or liqueur of your choosing. I freeze a container to the put the sorbet in so it won’t melt when you take it out of the machine. Freeze it immediately. If the sorbet hardens a bit after being frozen for a couple of days, you can temper it by letting it “warm up” in the refrigerator for 20 minutes before serving. HINT: the greatest thing about sorbet is it can be frozen, thawed and refrozen over and over. 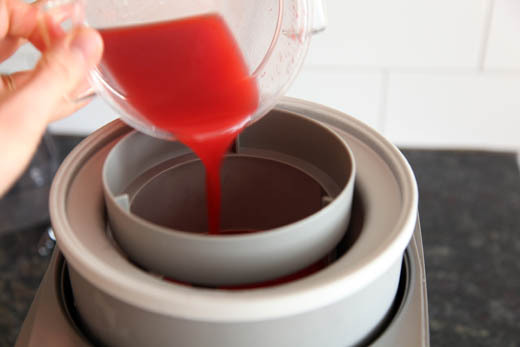 If your sorbet has been in the freezer for a while and is losing its nice texture, just thaw it and return it to the ice cream maker to freeze it again. This way you don’t have to use gums and other stabilizers to insure a great texture. Recommended book on Sorbet and all things tasty and frozen is by David Lebovitz called The Perfect Scoop! Zoe, we (Greeks) use the same method to get the right amount of salt for brining grape leaves, feta cheese or for olives! That is so cool, I didn’t know that! Thanks for letting me know, I’ll have to give it a try! WOw, this is wonderful! I can;t wait to make some when it gets warmer! As a home brewer/winemaker I already own a refractometer. 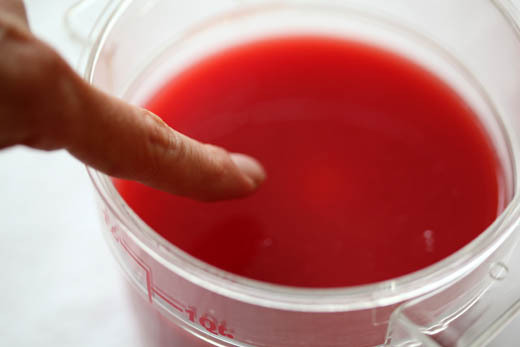 What is the measurement range that you are looking for in a sorbet (in Brix or SG)? Are there multiple ranges for different textures? Thanks. Yes, I was just having this conversation on Twitter with a pastry chef and you do need to understand the fruit and its starch content and other factors, but for most juices you can get away with a straight number. Now, what that number is varies from pastry chef to pastry chef. My instructor at the CIA, who I bought the refractometer from had us using 24 to 26 as the target. I have heard others using an even higher number, up to 30. At that point it is really up to your taste, as long as it is in the range. I just tested this batch of grapefruit and blood orange sorbet with my refractometer and it was at 28, which is right within the range. On the high end, but still in range. OMG, I never knew this trick, thank you so much Zoe, I learn a lot from you. Can’t wait to make the sorbet in summer. What a great post–thanks for this very useful information! Thank you so much for realizing that there are those of us out there who hunger for this kind of information, but aren’t able to go to culinary school! I am so jazzed! Awesome – I was wondering about a technique for keeping sorbet (and ice cream) not too hard. And I’m a sucker for anything involving science! Now you have me wondering why to stop when the egg is just starting to float. If the solution is too saturated with sugar, it will just be runny and not freeze well or will just be cloyingly sweet. This is also true if you add too much alcohol. Two very useful bits of information for me! I’m going to try out the egg thing next time I make sorbet, and I have some past-its-prime sorbet I’ll be refreezing tomorrow! How nice of you to share such great tips! I wonder of I thaw the sorbet (for its loss of nice texture), do I need to put them in the ice cream making again or just put it straight back to freezer? Thank you again. I really love your site! You will need to refreeze the sorbet in your ice cream machine to get the texture back. Thanks so much, I’m very excited to figure this out! Thanks Zoe, great tip! Thanks for sharing. What brand of chinois do you recommend? Do you have the wooden tapered device that goes with it? I just put a link to the same one I use in the post, so you can see it. I don’t use the pestle, but I do use the back of a small (2-ounce) ladle. Ciao Zoe, thank you so much for the very useful tip , I can’t wait to show it to my kids ! Thanks for the information about the chinois, Zoe. I had looked at some in a kitchen store and wondered if you used the stand that comes with some? When is that useful? Also, do you have the dimensions of the one you have? Gobel didn’t say in the ad. It appears to be the fine mesh, not the little holed type? A chinois is always very fine meshed. There are also strainers called “China Cap” which are made of perforated metal and tend to be much less expensive, but do not strain quite as much from the liquid. The stand is helpful when you are trying to hold a heavy pot to pour the liquid out into the chinois. I have never used one, but sometimes wish I had one! Mine is 8″ across at the top. Cool trick! I’m excited to try this! Is the liquer necessary? I don’t enjoy the flavor of alcohol and want to share my treats with my toddler! No, you don’t have to use the liqueur, it just gives a little insurance against freezing too hard. Fantastic trick, thank you so much! Madame, floating an egg is much cooler than using a refractometer. It just is. Love it! Can the simply syrup be made using Splenda and how would it effect the sorbet? This is such an interesting question. I don’t have any experience using Splenda in this kind of recipe? I fear that it will not produce the same density of liquid and will therefore not work in the same way to suspend the egg? Worth a try, but I would try it in a very small batch in case you are not happy with the result. What a great post. I love little tips and tricks like this. Bravo! What an awesome trick! I make sorbet a lot in the summer so I will certainly give this a try. Thanks. I just found this fabulous post via Fine Cooking. Thanks for such a brilliant yet simple way to get consistent success making sorbets. This makes me want to make this a sorbet summer, trying different juice flavors as new fruits come into season. Thank you. I’m getting the ice cream freezer out today. Thank you for the lovely note, so glad you stopped by. Enjoy all the sorbet this summer! Does the freshness of the egg matter? After all, the test for age in an egg is that, in a bowl of water, fresh eggs lie on the bottom, not-so-fresh but still usable eggs stand on their point on the bottom, and stale eggs float off the bottom. This would affect the results, wouldn’t it? Yes, you are probably right on about that, but I have never found it to make a profound difference. In order for the solution to have enough mass to suspend the egg, the difference between fresh and not-as-fresh is then negligible. If you are interested in getting very precise measurements, then I recommend a refractometer, which is also fun to use! Thank you so much for this – I have always been afraid of experimenting with sorbets, but now I can’t wait to try some! I was just looking at a Cuisinart Ice Cream Maker at Costco. We have a large old fashioned one — makes a tremendous racket, you have to add ice and salt, and is messy so I make it in the garage, and also use it but once in a blue moon. So a smaller machine would make it easier to whip up a batch of whatever fruit is in season. I was thinking of making a sorbet based on an Indonesian avocado treat, but wasn’t sure how to measure how much sugar so it wouldn’t be too icy. Then I read your wonderful post! Serendipitous! The ingredients for the treat are simple: chunks of avocado, condensed milk, grated palm sugar, a smidgeon of coffee, on chipped ice. You can also do it as a smoothie. For the sorbet, I will still have to experiment to figure out how to keep the avocado from turning brown, though I’ve done it as a mousse and it stayed a delightful light green. Thank you for sharing and welcoming everyone in your kitchen! Your sorbet sounds out-of-this-world! Please let me know how it comes out. One thing to keep in mind is that your sorbet base is going to be very thick and an egg will probably sink in it, no matter how little sugar. I think because of the texture of the avocado you will have a lovely sorbet and should just do it by taste. The trick will be to eat it before it has a chance to get too hard. So I would plan to serve it within a couple of hours of making it, just to be on the safe side. Have fun making sorbet with your grandkids, what a treat for you all! Thanks for stopping by. or you guys could just make your sorbet in the Thermomix in 1 minute – perfect not icy and you don’t even have to churn it. I don’t usually allow people to plug their products on my site, but I am intrigued by this machine! Would love to try one someday. I hate to ask this, but what if I want to make a sugar free sorbet. I was recently diagnosed with type II diabetes and have to watch my sugar intake. I’ve been baking with Splenda substituted for sugar and my recipes have been tasting great. Will it also work for the sorbet? Or, you can freeze the mixture in the ice cream maker and just serve it right away. Once it sits in the freezer for a while it may be a solid block of ice??? Hi Zoe, wonderful post as usual! Do you have a favourite ice cream maker that does the job for sorbet? I often prefer going on recommendations. I’m also shopping for a food processor and trying to figure out which one (perhaps cuisinart or kitchenaid) would be best at making pesto. Do you have any experience with that? If you would rather not post your answer on your blog, you could always email me directly. I would be very appreciative. This is the ice cream maker I have: http://www.amazon.com/Cuisinart-ICE-30BC-Indulgence-2-Quart-Automatic/dp/B0006ONQOC/ref=sr_1_1?s=home-garden&ie=UTF8&qid=1307992282&sr=1-1 It is a nice mid-priced option. The machines with the freezer built in are a plus, but they are much more expensive. Thanks for the terrific tips Zoe. Looking forward to trying your method. Recently at a culinary conference I discussed another chefs usage of pectin in sorbet to make it smoother. Any thoughts? We were talking about a blackberry-plum sorbet. She cooked the plums skin and all with the blackberries and said it made a smoother sorbet. Yes, pectin and some gums will also help get you a lovely texture in your sorbet. 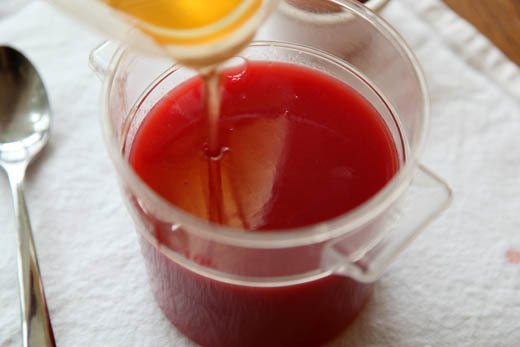 Many fruits will naturally have pectin and their textures will be improved as a result. Amazing that your cuisinart food processor has lasted you that long. Does it produce smooth pesto? I will have to make a decision soon on which food processor to get. Before we know it, it will be time to process veggies and herbs from the garden! What a wonderful organic and economical solution! Can’t wait to make coconut sorbet. Think it will work with coconut sugar? These are great tips, thank you. I will be making my first ever sorbet tonight. It is going to be a Pomegranate, Raspberry, nectarine sorbet. I am very excited I hope it turns out as beautiful and delicious looking as yours. Quick Question, what liquor would you recommend? Children and a pregnant woman will be eating it, so I am a little nervous. Any advice would be great. If you are serving the sorbet to kids and a pregnant woman you may want to stay away from the liquor all together. You can add the equivalent amount of corn syrup in place of the liquor. If I’d like to use less sugar (and instead add alcohol to prevent sorbet from icing up), would this floating egg method work the same way? Thanks.. And lovely pics by the way! Unfortunately, you do have to use a raw egg. I always scrub it clean before gently lowering it into the sorbet base. However, if you are going to use a sugar substitute and alcohol the egg won’t work, since it relies on the density of the sugar to keep it afloat. Thanks so much for this post – I had no idea why my sorbets sometimes just wouldn’t get hard! I also enjoy adding some whole milk to make a sorbet into a sherbet. How would the extra milk affect this test? Will the egg still work if you use it just with the fruit + juice mixture and then add milk, or does the different ratio of sugar in the milk mess it up? Any rules of thumb for sherbet? This is such an interesting question! How much milk is in your recipe? The recipe I am using as a base is from Lebovitz’s Perfect Scoop. His Raspberry Sherbert recipe calls for 4 cups whole raspberries, 2 cups whole milk, 1 cup sugar, and 1.5 tsp lemon juice. I’d like to make a tangerine sherbert with 2 cups tangerine juice, half a cup of lemon juice, 2 cups whole milk, and the appropriate sugar level. i just read this and the results in picture was extremely beautifull..
i was already try, but still wait for the results..
thanks for share this,, it was verry helpfull because i was searching perfect sorbet for my coffee shop..
and/or recommend? Yours looks professional and well made and I’m looking for the same, thanks. Hi! Wonderful post! I already bought my refractometer. Just one thing, here in Europe, and at least in Spain eggs are just cleaned with sand (high pressure) so the outer egg is kind of not safe to put in anyliquid for human consumption, they are pretty clean and is quite remote to get any nasty thing but I would not risk. Hi. Have fun with your refractometer. It is a very fun tool. I always wash my eggs with dish soap before using it in my sorbet. So I made this and it has turned into more of a granita…..I think I added too much alcohol? It wasn’t freezing at all and was very frozen margarita like. I halved the liquid, added more simple syrup and a bit more water and chilled everything again and put in my kitchen aid ice cream maker. This time it froze more but it doesn’t have the same texture look as your pictures. Any suggestions? What is the fruit base that you are using? By adding the water, you are introducing the potential for ice crystals. Alcohol doesn’t freezes, so you have to use it very sparingly, maybe a few tablespoons or cook off the alcohol before freezing. Hi Zoe. My husband has a “Triple Scale Beer & Wine Hydrometer.” One scale measures Percent Sugar (Balling). Google tells me that the Balling scale is similar to Brix. The scale runs from 0-40. Can I use this to measure the sugar content of sorbet, aiming for a reading of 24-28?